Astrophotography or "Deep Sky Imaging" is one of the most technical types of photography and can test the skill and patience of even the most experienced photographer. There are a lot of technical aspects that need to be addressed, but for someone just starting out, it's easy to become overwhelmed. We will provide a few easy to accomplish steps that can help get you started with a minimal headache. A solid mount to hold your telescope and track the night sky accurately is probably the single most important part of your astrophotography set-up. It will provide a good stabile foundation for your gear and will allow you to add onto it in the future without problems. Look for something that is solid and will hold an adequate amount of weight for your scope, camera, and a lot of other future accessories. If your mount won't track reliably you will always feel frustrated with the "sloppy" results. We recommend an "equitorial" type mount and love the Celestron line. It doesn't hurt to start smaller and then upgrade as you get more experienced, but don't cut corners unnecessarily on your selection of mount. There are a lot of varying opinions in regards to telescopes. When it comes to imaging we have found the Schmidt-Cassegrain (SCT) type scopes are very good. Some astrophotographers prefer other types and they all have their benefits but SCT scopes are very versatile and are not cost prohibitive. Another type of telescope to consider is a Triplet Refractor. These will provide a wider view of the sky because of less magnification but very accurate color representation and sharp focus in all color wavelengths. Basically, they are very good performers but weaker on magnification. We recommend the Celestron EdheHD series of SCT scopes for sharpness from edge to edge of the image. The Meade 5000 Series Triplet is a very nice refractor and won't break the bank. Your main imaging camera is the second most important part of the imaging system but you don't need the latest and greatest camera on the market. However, keep in mind the general rule that "the newer the technology the cleaner the image"; for the most part this statement is true. You should select a camera that will perform well when shooting long exposures at high ISO (sensitivity) settings. Also, be sure to select one that is a good candidate for modification. Also, a camera brand that has good file compatibility with other software programs should be a consideration. Not all cameras are equal and some brands are not recommended for this purpose. An Auto-Guiding System is a separate automated camera and usually a smaller scope (attached to the main telescope) that will lock onto a star and control or "guide" the telescope mount very accurately which enables very long exposures. Without the use of an auto-guiding system you will be limited to shorter exposures of approximately 2 minutes or less before the stars in your images will start to "streak". This allows for moderately good exposures of brighter objects but is not adequate for dimmer objects. There are lots of different solutions that work well for auto-guiding. 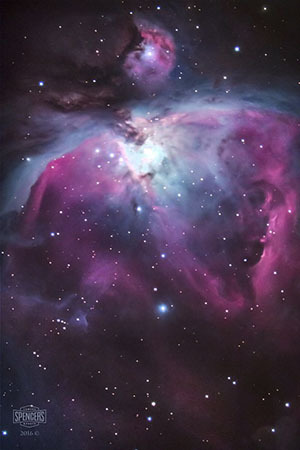 We recommend the Orion StarShoot Autguiding camera, PHD auto-guiding software (free), and Stellarium (free) for computerized control of your telescope mount. Celestron makes a standalone auto-guiding system (Celestron NexGuide) that works well for lower magnification imaging scopes but not so well for higher magnification scopes. It uses an 80mm guide scope in tandem with the NexGuide camera and does not require a computer. It is a good solution for someone on a limited budget and a lesser magnification scope. There are a lot of accessories to consider that will make things easier. A remote release for the camera which will allow triggering the exposure without touching the camera is a great tool. Use a cable long enough that you can stand back from the camera/scope and trigger the exposure without causing any camera vibrations. Also, tape or strap the cable to the tripod to limit small vibrations from cable movement and slack. Wi-Fi controlled release is also a good option but is not available for all cameras. A dew shield or scope hood will not only provide a good shield from accumulating moisture during a cold night but will also shield the end of the scope from uncontrolled light, reflections, and dust. A laser finder that can be attached to your telescope makes aligning your scope much easier. Also, consider a good bubble level for leveling your mount prior to alignment. The list of possible astrophotography equipment and accessories is endless. Our advise, keep it simple and start with the basics. Learn how to set-up, align and control your scope accurately. Learn the basic controls and functions of your camera. Learn the basics of autoguiding and remote computer control of your mount and cameras. All of these items will greatly improve your success and overall enjoyment of astrophotography. 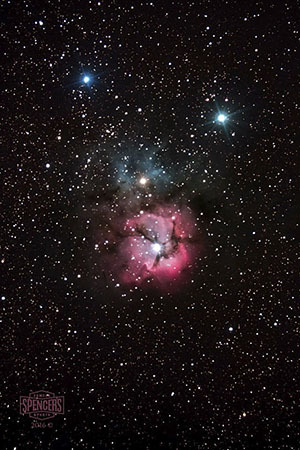 This should give you a good introduction to astrophotography and the basic equipment needs.